At Falling Lakes we are adventure and nature enthusiasts, who are keen to show you what Plitvice Lakes National Park and the surrounding area has to offer. We are your guide, if you are looking for the total local experience. We are located in the nearest town on the southern border of the national park, called Korenica and are a 15min drive from entrance 2. We offer a cheap daily shuttle service from the hostel to the park and back (40kn return ticket and 20kn oneway). The shuttle leaves at 8:00 in the morning from the hostel and comes back at 16:00 from the national park. When we fill up the first shuttle, we add a second or third every 30 min thereafter depending on how many guests need to go on a given day. For your nature fix you can partake in many other outdoor activities while staying with us. 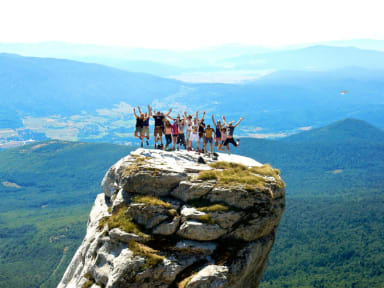 Here are our three highlights: the pljesevica mountain trek that leads upto a famous military base from former Yugoslavia (this free hike starts right outside the hostel and takes you to the border of bosnia with stunning views, hint: it’s the hike with the awesome rock in the picture), kayaking (a full day of going down rapids and waterfall jumping, no previous experience required), mrsinj grad hike (sunset hike, gorgeous views, remnants of an old fortress). There are numerous other hikes and activities you can do in the region just ask us when you check-in :) Find us online for more info. Arriving by bus: Korenica has its own bus stop, so when booking your bus tickets to the hostel make sure you get a ticket to Korenica and not to Plitvice, otherwise you will end up stranded and in the middle of nowhere with miles of surrounding wilderness. You can purchase your bus tickets on www.getbybus.com, or if the online sales are closed for your dates you can buy them at any local bus station, or even directly from the bus driver. The bus stop in Korenica is a short walking distance from the hostel, so are all other amenities like supermarkets, restaurants, bank etc. With sustainability in mind we designed our hostel to have solar thermal water heating, LED lighting and composting of all organic waste. Our hostel has comfy dorms with custom made bunk beds that have built-in lockers, a personal plug and a reading light. In our common room area you can hang out, read, play board games or enjoy a locally brewed beer. Some of our other services include: free wifi, free parking, free linens, free locks for rent, towels for rent, shared fully-equipped kitchen, luggage storage, outdoor patio, BBQ, and lots of free activities and events. Awesome hostel! Has everything you need... Events, shuttles, day trips, etc... One of the best on my journey. The best hotel we stayed in. We met the most amazing people and had so much fun playing card games till midnight and cooking together. Clean and with everything you could want! Just be careful about booking buses to get there - bussing to Plitvice does NOT work and you need to go to Korenica, as we learned the hard way! Had a wonderful stay here. A super clean hostel. Pretty nice bedrooms, bathrooms and kitchen. Staff was very helpful, explaining everything in details. I enjoyed my stay at Falling Lakes. It was a short walk to and from the bus station/the center of town and they offer shuttles to and from Plitvice Lakes (which is what most people go to Korencia for). The hostel was clean and had huge showers which was really nice! I found the staff to be very pleasant and helpful. cleanest hostel i have stayed in. great little spot. with awesome facilities and good atmosphere. Falling Lakes Hostel is an amazing hostel if you're planing on visiting the Plitvice lakes! They offer a affordable Shuttle at 8 o'clock in the morning to the lakes and back. 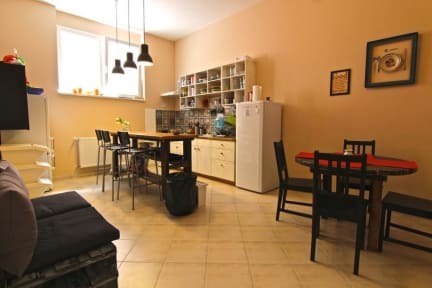 Due to the off season the atmosphere at the hostel was quite dead, however during summer I believe it must be great staying there, since the common area and kitchen are both very big. Everything was very clean and I felt super secure, hence I'd definitely recommend Fallings Lakes to everyone!